GRAND RAPIDS, Mich. – To coincide with the Fourth of July weekend, SpartanNash (Nasdaq: SPTN) is launching its first-ever companywide fundraising campaign to support military heroes and honor those who lost their lives defending our freedoms. The scan begins on June 22 and will run through July 4. 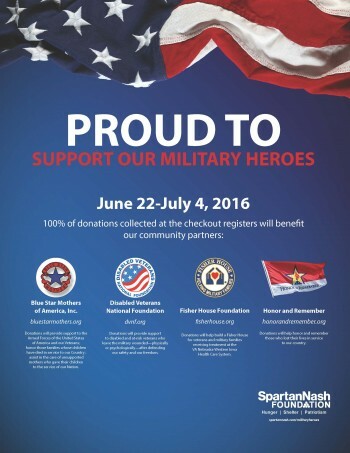 Customers who visit any of the more than 160 SpartanNash-owned retail stores or fuel centers in nine states during the 13-day span will have the opportunity to donate $1, $5 or $10 at any checkout lane. When customers make a donation, they will receive four coupons toward Spartan® or Our Family ® brand products. Depending on the store’s location, 100 percent of all funds raised during the patriotic scan campaign will go directly to non-profit organizations that support military heroes, veterans and those who paid the ultimate price. SpartanNash underwrites the costs to run the scan campaign as well as contributes funding and encourages associates to volunteer with the Foundation’s grant recipients. “Patriotism is one of our company’s core values, and SpartanNash is excited to support our nation’s military and veterans,” said Meredith Gremel, vice president of corporate affairs and communications and executive director of the SpartanNash Foundation. “SpartanNash is the leading food distributor to U.S. military commissaries and exchanges in the world, and this patriotic scan is one more way we can support the men and women who have served or are currently serving our country. For each dollar raised, 50 cents will be donated to Honor and Remember, a national non-profit working to create and promote a nationally recognized flag to honor all fallen servicemen and servicewomen. The remaining 50 cents will be donated to one of three regional partners – Fisher House Foundation, Blue Star Mothers of America or Disabled Veterans National Foundation. Donations in Nebraska and Iowa will benefit the Fisher House Foundation, helping to build a Fisher House for veterans and military families receiving treatment at the VA Nebraska-Western Iowa Health Care System. Donations in Ohio, Minnesota and much of Michigan’s Lower Peninsula will benefit Blue Star Mothers of America, Inc. supporting troops, veterans and families of fallen heroes while promoting patriotism. Donations in Colorado, Wisconsin, North and South Dakota and Northern and U.P. Michigan will benefit the Disabled Veterans National Foundation, which provides critically needed support for disabled and at-risk veteran who leave the military wounded either physically or psychologically. Stores will also host additional fundraising activities June 22-July 4 to benefit their two community partners. For a complete list of locations participating in the companywide scan campaign and the organizations they will partner with to support military heroes, visit: SpartanNash.com/militaryheroes/. The patriotic scan is the third of five scan campaigns the SpartanNash Foundation will execute in 2016. To date, nearly $350,000 has been raised for local Habitat for Humanity and Special Olympics partners.